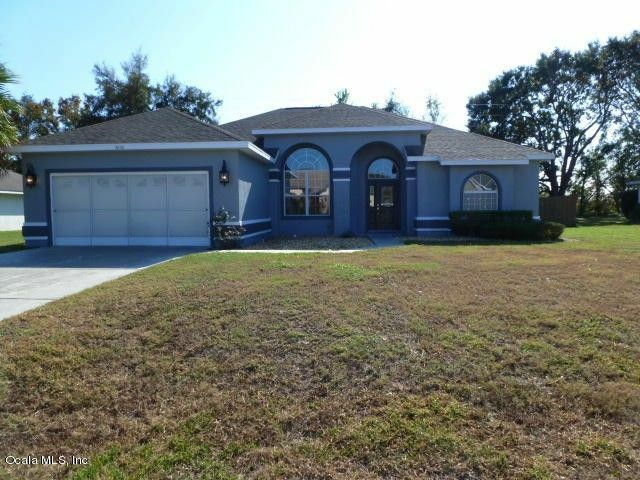 Start 2019 with a beautiul home in a great SW location and popular Majestic Oaks neighborhood. You will love this 3 bedroom spacious home. The home has recently been painted a pleasant Grey Exterior and living area a fresh off white. Enter into the beautiful stained glass door into the living and dinning area. Stroll into a large kitchen with many cabinets, a pantry and a built in desk! Pendants are over the bar and recessed lighting over the cabinets.The master has trey ceiling, double sliders to the lanai, a TV mount for your flat screen and a large master bath with soaking tub, double vanities. The 2nd and 3rd bedrooms have carpet, the master and living areas have laminate flooring. Check out the nice lighting throughout and many ceiling fans. the screened lanai and large fenced in backyard. Priced to sell. Directions: West Of I-75 on College Rd to 60th. Ave. Turn left and follow to 89th Street into Majestic Oaks . 1st right is 89th Place and home on the right.